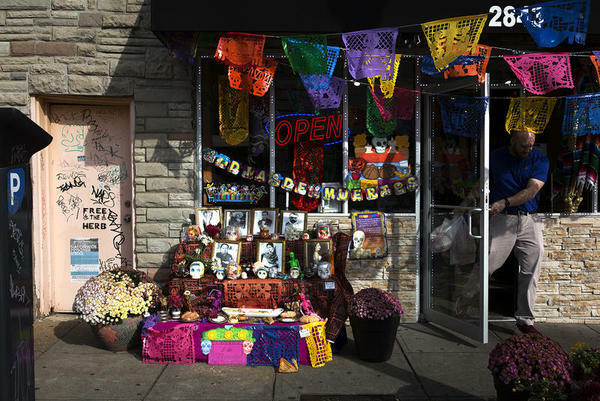 FILE PHOTO: The owners of Diana's Bakery, at 2843 Cherokee, set up a DÃ­a de los Muertos altar honoring Mexican celebrities in 2016 on Cherokee Street. "This puts the area on the map officially," Restrepo said of the cultural designation. "On the map, it used to be called 'Little Mexico,' but we want to honor all Hispanic and Latino businesses on the street. We didn't want it to be exclusive, calling it 'Little Mexico,' but by calling it 'La Calle Cherokee,' we still kept the name of the street and gave a nod to Hispanic and Latino business owners who are there." Meet "La Calle Cherokee," a newly designated Hispanic/Latino cultural district on, you guessed it!, Cherokee Street. St. Louis on the Air contributing host Steve Potter takes us through what is happening this weekend as the designation is made during Fiesta Patrias on Saturday. When: Saturday, Sept. 16 from 10 a.m. – 11 p.m.